Click on image pains for more complete information. 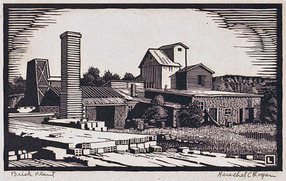 SOLD - Herschel Logan "Brick Plant" 1923, Woodcut. 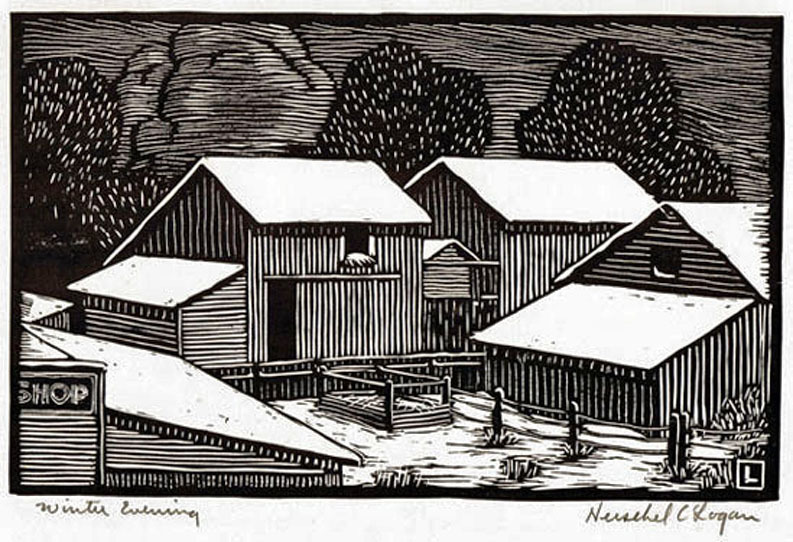 Herschel Logan "Deserted Shanty" 1923, Woodcut. 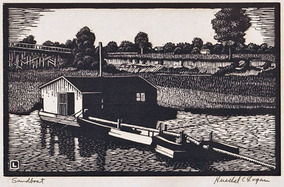 SOLD - Herschel Logan "Sandboat" 1938, Woodcut. 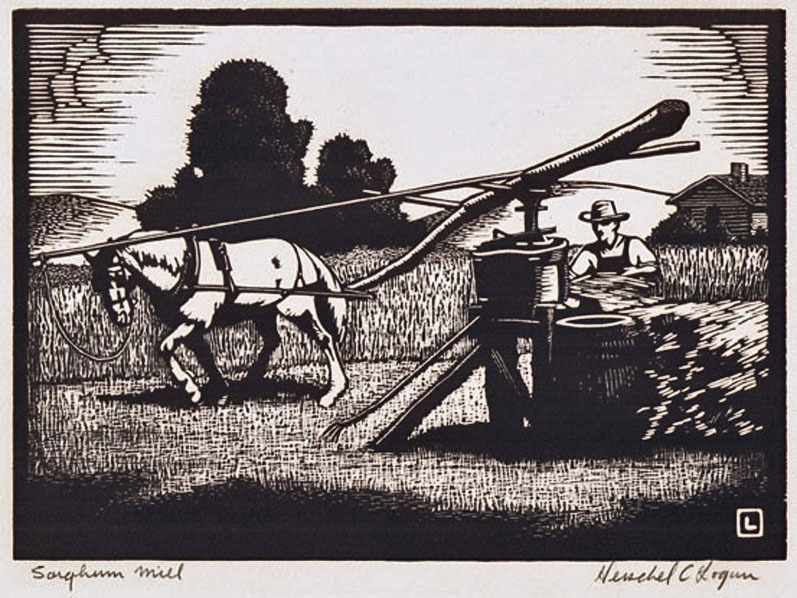 SOLD - Herschel Logan "Sorghum Mill" 1938, Woodcut. SOLD - Herschel Logan "Winter Evening" 1924, Woodcut. 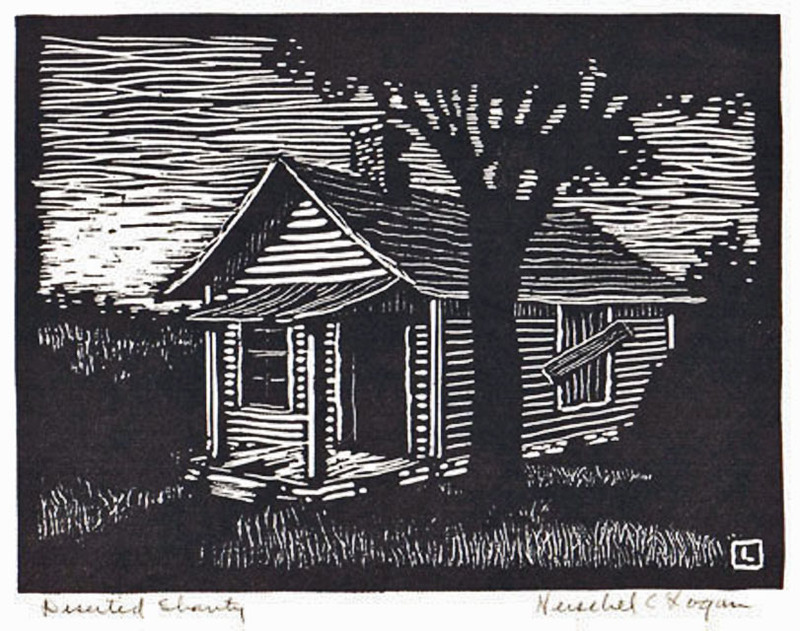 Herschel Logan was one of those remarkable artists who produces art, in this case primarily woodcuts, for a number of years and then just shuts down. No more woodcuts. As Barbara Thompson O'Neill and George C. Foreman point out (1984:40-43) Logan's production of woodcuts existed from 1921 through 1938 and although the artist lived until 1987 he never again created woodcuts. However, during his productive years he produced approximately 140 woodcuts, many in editions of 50 or less. On December 28, 1930 the heavily influential artists group the Prairie Print Makers was formed. Logan was one of the charter members of the organization. Aligned with Logan the other charter members were Charles M. Capps, Leo Courtney, Lloyd C. Foltz, Arthur W. Hall, Norma Bassett Hall, C. A Hotvedt, Edmund Kopietz, Birger Sandzen, C. A. Seward, and Carl Smilley. In many ways the Prairie Print Makers was designed like the original Taos Society of Artists with members being active, associate, or honorary. The prints being offered here were held for a number of years by Anthony L. Lehman who no doubt acquired them directly from the artist while he compiled a catalogue raisonné of Logan's prints (see Lehman 1986). All are in excellent condition and all almost certainly have been in flat storage since they were created. References: O'Neill and Foreman 1984, Lehman 1986, and Exhibits USA, multi-authored (2001).